It was the talk of the town. Few in the world of kid-dom could believe it. But, as School Committeeman Rich Maronski recalled, Scottie Holden did climb the Soldiers’ Home water tower and it was the stuff of legend growing up in Chelsea. His remembrance was but one of many that were shared at a special farewell to the Soldiers’ Home water tower last Friday, Nov. 30, in the shadow of the tower, which was constructed in 1958 and will come down in the next few weeks. It has to come down to make way for the $199 million Community Living Center that will provide long-term care for veterans in a modern, home-like setting. Currently, the Quigley Hospital provides great care, but it is laid out in open wards, which are no longer acceptable. Supt. Cheryl Poppe said CBI Corp. put up the six-legged water tower in 1958, and the purpose was to help the water supply and water pressure at the home. Over time, however, the tower became less useful and a permanent pump station was implemented in 2011. The tower was decommissioned at that time, but allowed to stay in place. Over time, it has deteriorated and vandals have painted it. “It was a noticeable part of the Chelsea skyline, but now our Community Living Center will serve as a special vision on the horizon as it will serve our veterans for the decades to come,” she said. Tom Kasiecki said he has watched the tower all his life. Former City Councillor Matt Frank said he is going to miss the tower, and that it is special to him, but he also said he will choose to remember it now as a place of hope and rest for those who have served their country – as it was for his grandfather when he was there. Dottie Kusmierek has lived across the street from the tower for most of her life. She said it holds a special place in the hearts of her family members. She said it will be hard to see it go, but she understands the reasoning. Councilor Luis Tejada said he would definitely be sad to see it go, and it’s a part of the local history to him. The Chelsea Soldiers’ Home water tower – a beloved local landmark – is slated to come down next month, and this Friday, the Soldiers’ Home is inviting everyone to its grounds to give an official good-bye to the red and white checkered symbol of Chelsea. Poppe said the tower has to be taken down due to the new $199 million Community Living Center project, which is starting construction now and will be in full building mode this spring. The tower has been a beloved symbol of Chelsea for decades since being put up in 1958. The red and white checkered tower was used to pump water, but for many more it became a symbol of the City of Chelsea – with people being able to see its ‘Chelsea Soldiers’ Home’ lettering from far and wide. Poppe said it hasn’t been functional since 2009, and is structurally unsound now. There was no way to save it from the wrecking ball in order to build the new Center, but they do plan to commemorate it with a photo montage or a small model on the property. In addition, part of Malone Park will also be taken up soon by fences that will be used for construction activities and parking. The Soldiers’ Home has had many scares over the years due to underfunding and the fact that the Quigley Hospital has open wards, something that was permitted in the past but no longer is. Poppe said the fact that the hospital is getting a remake is a tribute to Lawrence Quigley, who advocated for years and years to get it built in the first place. She said there was quite a lot of folks who were sentimental or upset about the removal of the tower at first, but she said she believes in recent months many have seen the value of the overall project. “The residents have a sentimentality for the tower, but at this pint they realize it is more important for veterans who need long-term care now and in the future to be served by this Community Living Center,” she said. The farewell to the Chelsea Soldiers’ Home tower will take place on Friday, Nov. 30, from 11 a.m. to 1 p.m.
Gov. 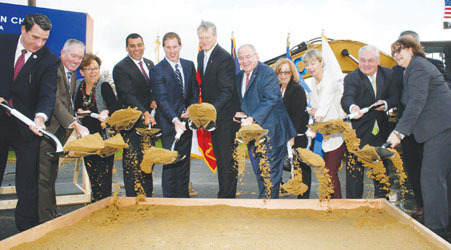 Charlie Baker and Speaker Bob DeLeo lead the way in breaking ground for the new Community Living Center at the Chelsea Soldiers’ Home this past Monday, Oct. 29. The new Center will eventually replace the Quigley Memorial Hospital. It is a state and federal project costing $199 million. families, breaking ground Monday on a $199 million Community Living Center (CLC) that will provide modern accommodations and replace the old Quigley Memorial Hospital. Gov. Charlie Baker joined Secretary of Administration and Finance Michael J. Heffernan, Secretary of Health and Human Services Marylou Sudders, Secretary of Veterans’ Services Francisco Ureña, House Speaker Robert DeLeo and veterans of the United States Armed Forces for the groundbreaking of the new long-term care facility at the Chelsea Soldiers’ Home. The current facility will continue to be fully operational, caring for 154 veterans, during the construction process with an anticipated project completion date in 2022. Some 65 percent of the funding for the new facility will come from the Federal government, which approved monies for the project earlier this summer. House Speaker Bob DeLeo was also on hand and has been a friend to the Home for years. Gov. Baker gave credit to DeLeo for getting funding through the Legislature so that the federal application was prepared quickly. DeLeo said the Home does have a special place in his heart, and serves veterans from his district as well. “I am so pleased this project is underway and moving forward,” he said. In May 2017, Governor Baker HYPERLINK “https://www.mass.gov/news/baker-polito-administration-releases-fiscal-year-2018-capital-budget-plan” t “_blank” announced plans for a new long-term care Community Living Center, which was included in the Baker-Polito Administration’s Fiscal Year 2018 capital investment plan, and in November 2017, HYPERLINK “https://www.mass.gov/news/governor-baker-signs-bill-to-fund-new-facility-at-chelsea-soldiers-home-and-high-speed” t “_blank” signed legislation authorizing funding needed to advance the project. The Administration has also received funding authorization from the United States Department of Veterans Affairs (VA) for the project. The federal funding was awarded through the VA’s State Home Construction Grant Program which provides reimbursement of up to 65 percent of construction costs for approved projects. The Administration, with strong support from the Legislature, plans to spend approximately $70 million net of federal reimbursement on the project. The Home has long suffered from having open wards at the Quigley, and it was a point of contention for federal authorities – as health care payments are not allowed to go to facilities with old, open wards. With funding on the line, the Home was able to secure the project funding. This will allow the Home to now have private rooms and modern facilities for the residents there. HYPERLINK “https://www.mass.gov/orgs/soldiers-home-in-chelsea” t “_blank” The Soldiers’ Home in Chelsea first opened its doors to Massachusetts veterans in 1882. The first residents were Civil War veterans who were wounded or unable to care for themselves, many of whom had previously resided in the Commonwealth’s “alms houses.” Today, Chelsea carries on Massachusetts’ proud tradition of helping all veterans in need of both long term care and domiciliary / supportive services. Chelsea is surveyed annually by the Federal Department of Veterans Affairs (“VA”) and the Center for Medicare and Medicaid Services (“CMS”). It is also fully accredited by The Joint Commission on Accreditation of Healthcare Organizations (“Joint Commission”). Chelsea has a Board of Trustees appointed by the Secretary of Health and Human Services. The trustees and DVS share responsibility for the management of the home. Chelsea Soldiers’ Home currently has capacity for 136 beds for long-term care. 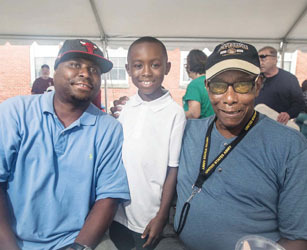 Three generations of the Lewis family came together for the fun afternoon: Derrick and Derrick Jr. (8) visit patriarch CW Lewis, a resident at the Soldiers’ Home. Gov. Charlie Baker announced last Friday that the state has secured approximately $70 million in federal funding for the new 154-bed Community Living Center at the Chelsea Soldiers’ Home – federal funding that pretty much gives the green light to proceed on the project. State leaders have made a priority of designing and funding the $199 million project, but getting the federal funding was always a crucial piece of the puzzle that had to come through. On Friday, the Veteran’s Administration State Home Construction Grant Program announced it would provide a 65 percent reimbursement of approved construction projects, including the Soldiers’ Home. The Community Living Center at the Chelsea Soldiers’ Home will provide 154 “home-like” rooms for veterans in accordance with VA standards of design, which promotes greater accessibility, mobility, and enhanced quality of life. Services will include physical and occupational therapy, recreational activities and greater access to the outdoors. The current facility, the Quigley Memorial Long Term Care Center, will continue to be fully operational during the construction process with an anticipated project completion date in 2021. In May 2017, the Baker-Polito Administration announced state funding for the new long-term care facility as part of the Fiscal Year 2018 capital budget plan, and in November, Governor Baker signed legislation to fund the project. Governor Baker was joined at his 2018 State of the Commonwealth Address by U.S. Navy Veteran Tom Miller, who lives at the Chelsea Soldiers’ Home, Director of Nursing Debbie Antonelli and Superintendent Cheryl Poppe to celebrate the Administration’s commitment to this necessary funding. The Soldiers’ Home in Chelsea first opened its doors to Massachusetts veterans in 1882. The first residents were Civil War veterans who were wounded or unable to care for themselves, many of whom had previously resided in the Commonwealth’s “alms houses.” Today, Chelsea carries on Massachusetts’ proud tradition of helping all veterans in need of both long term care and domiciliary / supportive services. Chelsea is surveyed annually by the Federal Department of Veterans Affairs (“VA”) and the Center for Medicare and Medicaid Services (“CMS”). It is also fully accredited by The Joint Commission on Accreditation of Healthcare Organizations (“Joint Commission”). Chelsea has a Board of Trustees appointed by the Secretary of Health and Human Services. The trustees and DVS share responsibility for the management of the home. 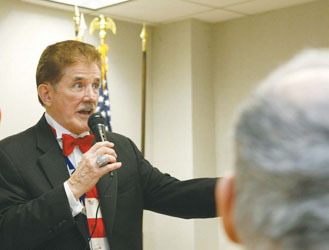 Boston Bruins’ famous National Anthem singer, Rene Rancourt, has spent 41 years singing before Bruins contests, and last Thursday, Jan. 11, he spent an afternoon at the Chelsea Soldiers’ Home singing and entertaining residents and staff. The time was put together by the Chelsea District Court staff. Gov. Charlie Baker signed a capital bond bill on Tuesday that increases bond authorization by $244 million to support initiatives across the Commonwealth, including construction of a new long-term care facility at the Chelsea Soldiers’ Home. 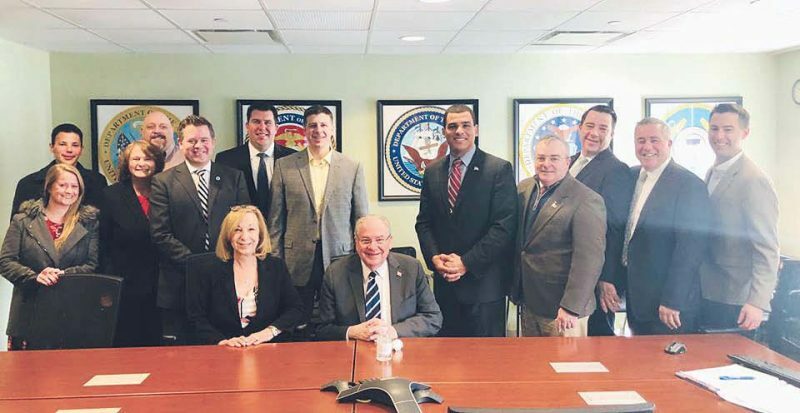 The bond legislation signed Tuesday includes $199 million to replace the long-term care facility at the Chelsea Soldiers’ Home, which is expected to be partially reimbursed by the federal government pending final approval from the Department of Veterans Affairs. The bill also directs the administration to study the long-term needs of the Soldiers’ Home in Holyoke. On May 31, Gov. Baker filed egislation to address immediate capital needs statewide, including $950 million for higher education projects, $880 million for construction, renovations, and accessibility improvements at state office buildings, $700 million for health and human services facilities, $550 million for public safety facilities and $375 million for court facilities. While the legislation signed Tuesday includes authorization for the Chelsea Soldiers’ Home, several items from this bill remain pending. State officials made their first presentation of the proposed Community Living Center at the Soldiers’ Home, a project that will replace the Quigley Hospital and require the removal of the iconic Soldiers’ Home water tower. The $199 million project, some 66 percent of which could be federally funded, has the makings of improving the living conditions of those in the long-term care portion of the Home – taking them from open wards that are no longer permissible to private rooms with social areas arranged in “houses.” However, to date, and through a large part of the meeting Thursday night, Aug. 3, the overall project has been overshadowed by the potential loss of the water tower. Some residents have voiced approval for the project, but want those building it to see if they can save the tower or come up with a similar iconic structure. Other residents have started a very popular online petition to ‘Save the Chelsea Water Tower,’ and it has caught on. On Thursday night, many of the voices of the veterans, who have yet to be heard, resonated. Tom Miller, who has lived at the Home for 11 years and is a member of the Honor Guard, said the priority is now the veterans. However, many long-time Chelsea residents said they hoped there could be a compromise. Councillor Matt Frank said he loves the Soldiers’ Home and all that it represents. He said he believes its time to support the veterans to get the new home, but he also said he hopes there can be some accommodation for the tower. Some in the audience suggested replacing it with a “ginormous” flag that could be seen from downtown Boston, as the tower is. Francisco Urena, secretary of Veterans Affairs, led the meeting and said that they are listening to the public and the residents. Both he and Supt. Cheryl Poppe said the status quo with open wards must be replaced, as they get marked deficient frequently and could lose crucial funding. To weigh in, the state has established an e-mail to submit comments. It is soldiershomeinfo@massmail.state.ma.us. More than 600 supporters have signed an online petition at Change.org in less than a week that is aimed at saving the Chelsea Soldiers’ Home water tower. The petition was started last Saturday by Chelsea resident Stephanie McCusker after she read the story in the Chelsea Record about the state planning to demolish the Soldiers’ Home water tower as part of its plan to build a new Living Center to better serve the veterans in the current Quigley Memorial Hospital. Apparently many from Chelsea, and those who once lived in Chelsea agree with her, enthusiastically signing the petition. Many others chimed in as well, and by Wednesday evening, there were 640 signees to the petition. The goal for the petition is to get 1,000 signatures. McCusker said she heard from a friend about the news of the tower coming down. The friend suggested that someone start a petition. Being a bit bummed out by the news, McCusker said she took it upon herself to start the petition. McCusker said her personal opinion is that it would be too expensive to preserve the old tower and move it to another location on the site. She said she would prefer to see it left as it, perhaps refurbished, and become part of the new plan. Last week, the state’s Department of Capital Assets, Management and Maintenance (DCAMM) confirmed that as part of the major Community Living Center project – which demolishes the Quigley Memorial Hospital and constructs a brand new, modern veterans living facility – the old water tower would have to come down. The news has been viewed as a tough decision, as no one wants the tower to come down, and no one wants the veterans project to be delayed or stymied. DCAMM officials have said, as have City officials, that they are looking at alternatives to keep some part of the tower alive.